Liya Kebede, Natalia Vodianova both on their third Vogue US covers if I remember correctly, each already nabbed a solo cover before. Anna Jagodzinska, only model not from IMG, DNA or Women (she’s from Next. ETA: take note Caroline Trentini just switched from Marilyn to IMG) to make the cover. Notice how they photoshopped her nose… she looks a little like Valentina (aka the Ralph Lauren girl). Ok maybe I have bad face id skills. She’s relatively lesser known compared to some others at Vogue but to be on the front page is a big deal so let’s celebrate the fact. 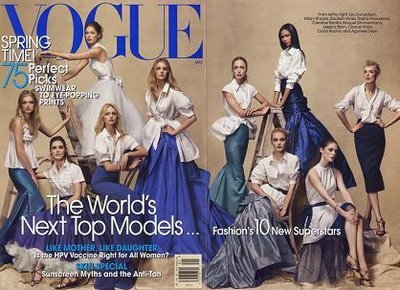 Natasha Poly, Jourdan Dunn (youngest here), Lara Stone— all making their Vogue US cover debuts. For Lara, first time appearing in the magazine, right on the cover. It’s only May, she’s been having a very Vogue-ful year (the Parisian counterpart, that Feb issue), you go girl. It’s just nine spots, but so precious. Don’t say who deserved to be in or out, it’s a pretty perfect mix of new+old, everyone of them is on the cover for a good reason. The cover shot in general is beautiful, a little retro, and clean, really focusing on their faces this time. I remember reading that 06 issue, at 832 pages it is gigantic. absolutely amazing. My faves are natasha, jourdan, and lara. i’m gonna have to say i’m incredibly disappointed. At last real models on the cover!Lets hope there’s not going to be any whinning or race issue about it.Just enjoy it while it lasts.The celeb-actresses will surely be back with a vengence! Wow 3 Brazilian cariocas together and I’m rather pleased to see Jourdan make it the cover.I remember how awkward and neglected she as when I first saw her on Alberta Ferretti’s runway a few years ago.She’s come a long way in a rather short time. Difficult to pick a favourite but I have a soft spot for Natalia V.
Now I can’t wait to see who will be featured inside of the issue. I still think the Sept 06 cover is the best. I’m really happy for Jourdan, she shines in this!! ^ typing error, but thanks. really typical( and bland) casting.lara and jourdan and even carol were nice choices. i can’t believe this is natasha’s first us cover! Great for Lara and for Natasha’s it was about time… I personnaly love this lineup for many reasons. Raf Simons going to Dior, going to do couture!